The Ghana Federation of the Disabled has expressed serious concerns on the fact that the country’s Disability Act has no provisions for children and women with a disability, humanitarian services and political participation among a host of other aps. The Federation has therefore called on Ghana’s government to expedite action on a review of the Persons with Disability Act (Act 715, 2006) to address these among other critical issues in order to meet international standards. Mr. Isaac Tuugun, Programme Officer expressed at a panel discussion organized by the Ghana Journalist Association, how the Federation had produced and submitted a gap analysis report to the Ministry of Gender, Children and Social Protection, to speed-up the review process of the Act, but to date nothing concrete had been done about it. Speaking on the topic Towards Amendment of the Law on Persons with Disability, Mr Tuugun, said the delay in the review process was affecting the rights of persons with disabilities to social services. He explained that while the UN Convention on the Rights of Persons with Disabilities (UNCRPD) promoted inclusive education at all levels, the situation in Ghana remains one replete with barriers. There are to date only a few special schools in the country, and those run by the government have serious issues. Private special schools are very expensive, unaffordable to most. Mainstream schools still struggle to include children with disabilities, out of lack of will or resources. Genuine inclusive education remains afar cry at policy and practice levels. Ghana’s Disability Act which came into effect in 2006, preceded the UNCRPD, which Ghana voluntarily signed in 2007 and ratified in 2012. Mr Tuugun said the harmonization of the Act will eliminate the difficulties and confusion arising in the application of the two pro-disability legislations, with the same objectives, but which differ greatly from each other in context and scope. “Though disability is an evolving concept, Act 715 had a closed definition of a person with disability while the UN Convention has an open definition to permit the inclusion of emerging categories of disability”, Mr Tuugun added. He said the Federation sees the phenomenon as unfriendly, and said the health care and employment provisions in Act 715 also suffer similar limitations. 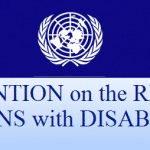 Making further comparisons, he noted that while the UNCRPD pairs close consultation and active involvement of persons with disabilities in decision-making processes, Act 715 prescribes nothing on the matter, calling on authorities to act fast to help save the federation from neglect. He urged the federation to test the law by going to court to ensure that anybody found flouting the law was punished to serve as deterrent. Mr. Kwamena Dadzie, Acting Executive Secretary, National Council on Persons with Disability said he found it difficult to understand why most of the modern structures were unfriendly to persons with disabilities. He said the Council was soon coming out with policies to ensure that buildings met suitable design.